In any given year, about a third of ski areas’ “new lifts” are actually lifts removed from other locations that are finding a new home. 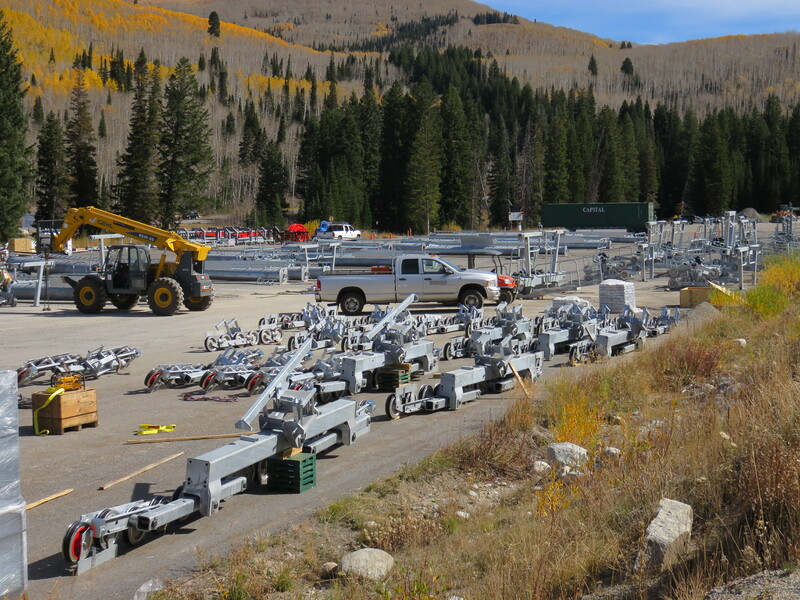 There are entire websites dedicated to the buying and selling of second-hand ski lifts. By my count, at least 374 lifts in the US and Canada have been re-engineered and re-installed at new places, either at the same ski resort or clear across the country. 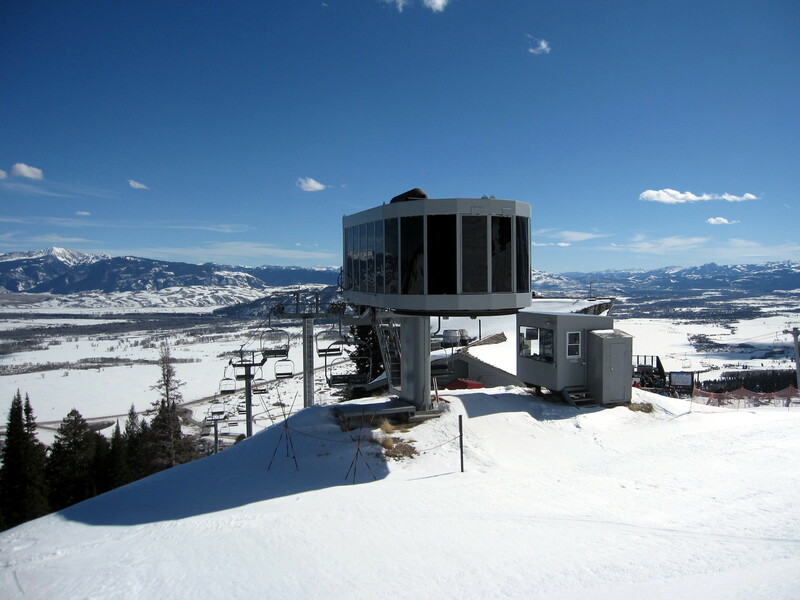 Jackson Hole’s Sweetwater lift, originally built by Yan in 1983, is in its second state and third location. Along the way it picked up some Poma chairs and Doppelmayr controls. The ski area that has sent the most lifts to other places is, not surprisingly, Whistler-Blackcomb. Ten of its former chairlifts live on at ski areas across the US and Canada. Some resorts operate fleets of lifts pieced together entirely from other places. Big Sky Resort operates nine used lifts, many of them hand me downs from other Boyne Resorts. Removed lifts that don’t get snapped up by other ski areas often end up at amusement parks and zoos. A single Garaventa CTEC fixed-grip quad was installed three different times at The Canyons over just five years in what I call the Raptor shuffle. A handful of lifts have been moved multiple times. The Dreamscape lift at Park City (formerly Canyons) is in its third location on the same mountain. Originally installed by Garaventa CTEC in 1996 as the Saddleback quad, it was replaced the very next season by a detachable quad. The fixed-grip quad became Raptor, which served the runs between Super Condor Express and Golden Eagle for three seasons, after which it was removed (and still not replaced.) That same summer, Raptor went to the opposite side of the mountain to anchor a major expansion called Dreamscape. I would not be surprised to see Vail Resorts replace Dreamscape this coming summer, giving the still-not-that-old quad chair a chance at a fourth life. Pomerelle’s new SkyTrac triple gets a name: E-Z Rider. Unfortunately 15 lifts already have the exact same name! Where’s the creativity? Speaking of questionable lift names, Summit Express towers are in at Solitude as are Sunshine Quad towers at Okemo. Lutsen’s new gondola is a beauty. The Mt. Baker-Snoqualmie National Forest approves replacements of two Riblet doubles at Stevens Pass. Kehr’s chair will be a replaced by a fixed-grip triple and Brooks by a shorter fixed-grip quad. Stevens saved the old Jupiter quad (a 1993 CTEC removed in 2013) presumably for one of these locations. The Forest Service also approved construction of a new rope tow! “On paper it works, in reality we’ll see,” says FIS race director Markus Waldner of the rush to finish the South Korean ski resort that will host FIS races this February and the 2018 Olympic Downhill. Doppelmayr has reportedly sent extra workers in hopes of completing the lift system by January 10th. Take a ride on the hottest chair in Canada. Whistler-Blackcomb is not a fan of the proposed Garibaldi at Squamish resort along the Sea to Sky Highway and 30 minutes closer to Vancouver than Whistler. Some background: the same developer invested $200 million to bail out Revelstoke Mountain Resort in 2008 and owns an NHL team. 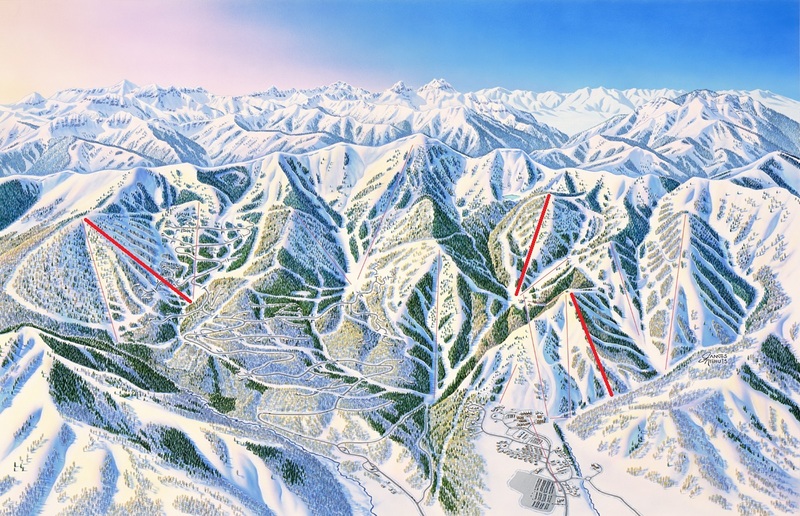 The master plan for Garibaldi has 18 lifts including a gondola, two six packs and four high speed quads. I put this proposal in the same category as Jumbo Glacier and Saddle Mountain. Ski Cooper near Leadville, CO wants to build a new T-bar with a pod of 5 trails but not for 3-4 years. It’s almost November and by my count construction is wrapping up on 33 lifts across the US and Canada. With the usual caveat that there could be a lift project I haven’t heard about, 2015 will be the fourth year in a row that the total number of new lifts has declined. 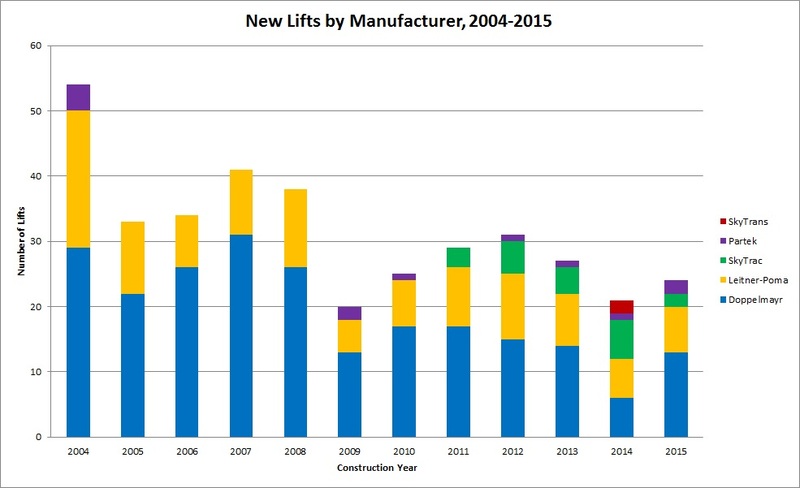 Nonetheless there are some encouraging trends – namely more of this summer’s lifts were (expensive) detachables and more were brand new rather than re-installations of used lifts. Click on the map above to explore our interactive map of 2015’s new lifts powered by Google Maps. Looking geographically, there’s no question the dismal snow situation last winter killed the market for lifts in the Sierras and Cascades. In a typical year, Washington, Oregon and British Columbia account for five new lifts and this year they had zero. The Rockies were a bright spot this summer, with at least one new lift being built in every Rocky Mountain state except Montana. Colorado had a particularly strong year, building five new lifts including four detachables. Utah had almost as good a year, thanks largely to Vail Resorts’ mega-project at Park City. Colorado averages 4.4 new lifts a year and Utah 3.3 and both came out ahead of those numbers this summer. The Midwest was about average for snowfall last winter but its ski areas built just one new lift and one used lift this year. The one bright spot was Lutsen in Minnesota which spent $7 million with Doppelmayr to rebuild the Midwest’s only gondola. Looking further east, Vermont was a success story, getting three brand new lifts from both Leitner-Poma and Doppelmayr. Despite averaging more than five new lifts a year, nowhere else in the Northeast invested in a new lift despite a stellar winter in 2014-15. Canada had a tough year with only three lifts going in at Sunshine Village, Boler Mountain and Mont Cascades. In a normal construction season the country’s resorts build 7-8 new lifts. My take is newer resorts in Western Canada – places like Sun Peaks, Revelstoke and Kicking Horse – were hit particularly hard by the Great Recession and still haven’t recovered. The non-profit organization that bought Soldier Mountain in Idaho from Bruce Willis wants out after three years. Now the entire ski area is for sale for just $149,000 (that’s the amount the organization owes its bank.) Included are two Stadeli double chairs built in 1970 and 1974. I’ve also heard Soldier has at least one lift from nearby Sun Valley in storage for expansion. The ski area’s master plan includes four new lifts that we may never see. Doppelmayr and Skidata think they have perfected gondola loading with the “easy boarding gate.” The system uses multiple ‘pods’ with turnstiles to enter. Flat screen monitors display how many spaces remain in each pod and guests self-select where to go. As gondola cabins enter the loading area, full pods are assigned to cabins with LED lights directing riders. I’m sure it works but why would a ski area want to pay hundreds of thousands of dollars to do what a $9 an hour lift operator can do? 22 towers fly at the Hermitage Club, soon to be home to the only 6-person Doppelmayr bubble lift in North America. Ironically the same helicopter flew towers from the Hermitage Club’s old triple the very next day at West Mountain in New York. Lots of new pictures of Sipapu’s new quad chair and an update on their blog. Drone footage of Crystal Mountain, Michigan’s “Backyard” expansion with eight new runs served by a used CTEC triple chair. Leitner-Poma takes the Facebook plunge. Their counterparts in Europe also have a pretty cool page! Peak Resorts, the fourth largest operator of lifts in North America, secures a $15 million line of credit for “resort development and acquisitions.” Might we see a new lift at one of their 13 resorts next summer? 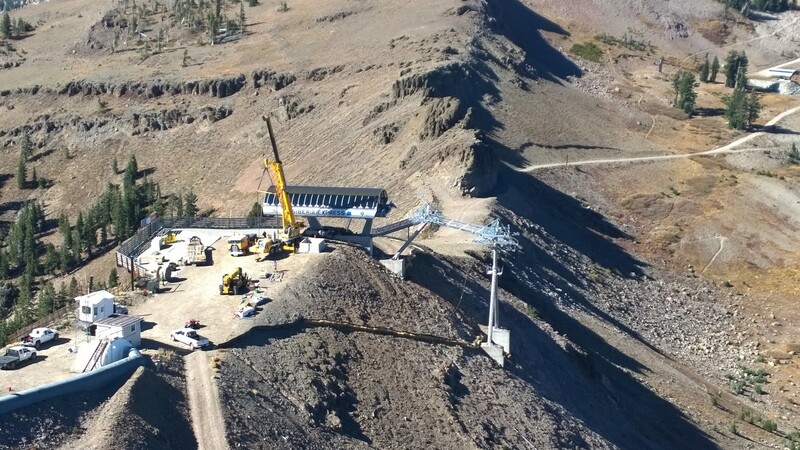 Lift tower and terminal components for Solitude’s Summit Express as seen last week. Towers were flown up the hill on Saturday. Squaw Valley has removed ten of its lifts since 2007 while building only four new lifts in the same period. What’s going on? Squaw is strategically removing redundant/older fixed grips like Cornice II and replacing first-generation detachable quads with newer technology. This summer’s project replaces the Siberia Express (a 1985 Poma) with an all-new Leitner-Poma six-pack. The new Siberia will be Squaw’s second lift with LPA grips and terminals. The first was the Big Blue six-pack, which replaced not one but three Yan lifts in 2012. The LPA grip is now used worldwide by both Leitner and Poma but terminals used in North America are designed and built in Grand Junction, Colorado. The original Siberia was a workhorse at Squaw for thirty years, operating in a harsh above-treeline environment. It had an old-school Alpha drive building and chain-driven contours. In addition to upgraded technology, the new Siberia should be less subject to wind closures with heavier chairs. 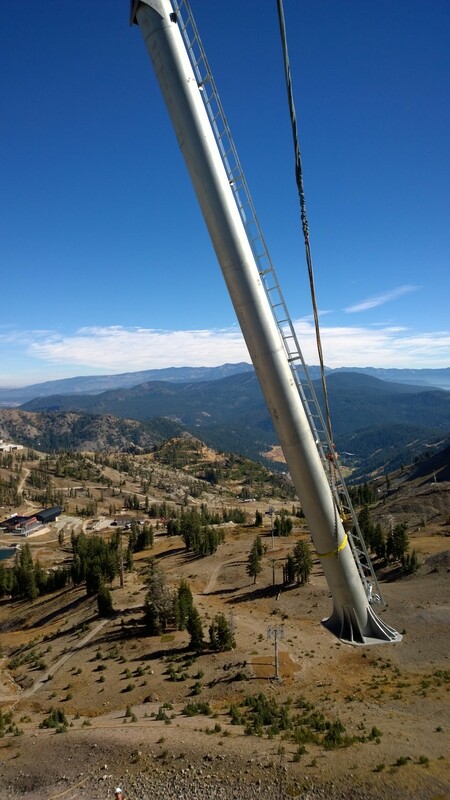 In a press release announcing the project, Squaw Valley CEO Andy Wirth noted, “upgrading the Siberia Express lift to a high-speed six-passenger chairlift is guaranteed to have a positive impact on the skier experience on the upper mountain at Squaw. In addition, the lift has been designed in a way that will improve its ability to operate during inclement weather.” Because its line is so exposed, the new lift has parking for all 56 chairs at the drive terminal. The first leg of a unique tower 13 is lowered into place. Take a photo tour of Doppelmayr’s new six pack and new-used double chair at Sugar Mountain, North Carolina. Looks like it will have 90-degree loading and unloading. Views from the air of Snowmass’ new High Alpine detachable quad and Arizona Snowbowl’s new SkyTrac. The Gondola Project has a new interactive map showing the world’s urban ropeway systems. 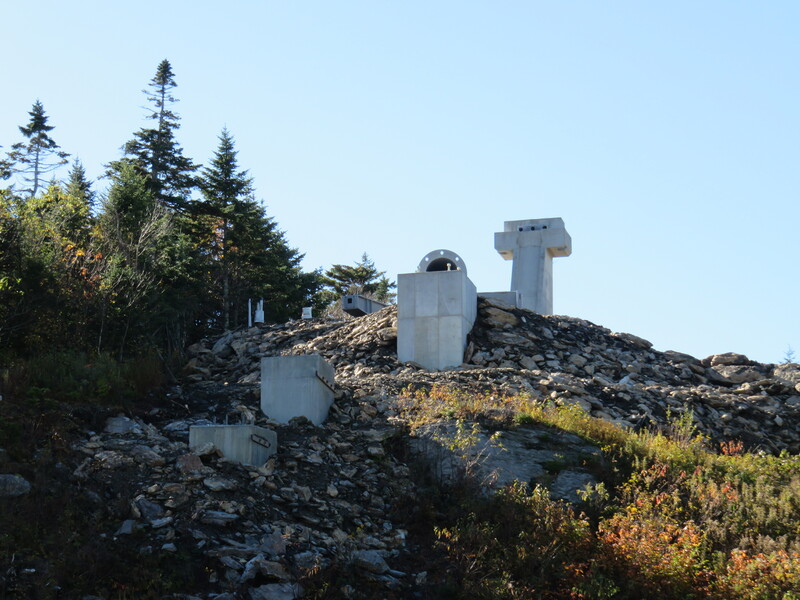 The last rides on Lutsen Mountains’ Hall Skycruiser gondola will be this Sunday, October 18th. The gondola is coming down this fall along with the Bull and Eagle double chairs. Tower footing for the new six pack at the Hermitage Club. View down the line of the new base-to-summit six pack. The ski area last operated as a public mountain in 2009 when it was jointly owned with Mt. Snow. Both mountains were part of the American Skiing Company empire from 1991 until 2007. When Jim Barnes purchased the property, it had two Poma triples and a CTEC triple. The club expanded with two SkyTrac quad chairs serving the lower mountain built in 2012 and 2013. This summer, the Barnstormer triple (Poma) was removed and a Doppelmayr six pack with heated seats and bubbles will take its place. Terminal location on the top of Haystack Mountain.